Free UK Delivery On All Orders Over £40 with Myprotein! When you have selected any of the above Myprotein discount code or voucher you are satisfied with – simply click on either the ‘Get Offer’ or ‘Get Code’ now button to get your money-off discount code or promotion. Make sure you have copied the applicable discount code from us by pressing either Ctrl + C or simply highlighting the discount code, right-clicking on your mouse and pressing copy. You will then be redirected to the Myprotein website where you will be free to shop as you please. Once you have selected a product you are happy to part cash with, add the product to your basket to proceed to the checkout menu. Upon viewing your basket, there will be an option to input your discount code before going ahead with payment (shown below by the red arrow). Add in your Myprotein discount code in this area and click ‘Use Code’. When you have applied your discount code, you will see a ‘successful’ green prompt at the top followed by the fantastic saving you will have made which will be highlighted in green above your total (both shown in the red boxes). And that is it! Simply complete the checkout process and enjoy your new wonderful Myprotein product in helping you realise your inner fitness. 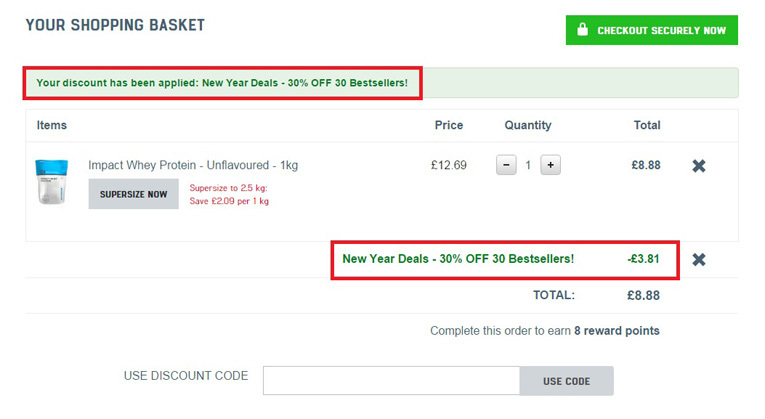 Remember: Always ensure you are using the highest Myprotein discount code available for maximum savings. Myprotein discount code and vouchers are added on a daily basis onto our website so always double-check and see if there is one that will offer you a greater discount than the one you are currently using! 1. Check that the Myprotein discount code or voucher is in-date ahead of use to avoid disappointment. 3. Double check you are eligible for the discount. Some discount codes are only exclusive to new customers so may not work if you are logged into Myprotein’s hub and have placed an order in the past. 4. It may sound silly, but ensure the product has been added to the basket first before attempting to apply the discount code. 5. Make sure the discount code and voucher has been pasted in or typed in the exact same way as displayed on our website to avoid case sensitive issues. If all else fails and you still cannot use the Myprotein discount code or voucher, drop us a line at: hello@checkmeowt.co.uk and we will be happy to get on the case and resolve the issue for you. Myprotein are the UK’s leading sports nutrition brand who have quickly become the #1 provider for all health and fitness supplement needs in Europe. With a selection of over 350 sports supplements and foods including flagship products such as Impact Whey Protein, 100% Natural Peanut Butter, Hurricane XS and Creapure® (Creatine Monohydrate). 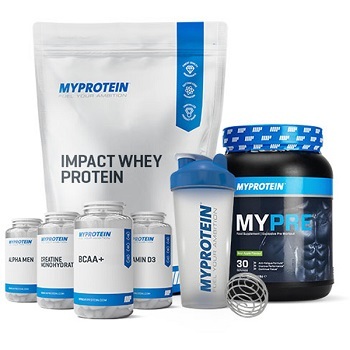 Not to mention the vast array of blends, formulas and bundles to choose from – Myprotein are one of the few brands who have successfully been able to create amazing value without sacrificing quality, all at affordable prices! Myprotein’s product range is constantly evolving with at least one new product introduced to their extensive range every week (including their delicious Protein Brownie). if you are looking to try something different without breaking the bank, be sure to visit our Free Giveaways page to see what Myprotein has to offer you this week. With the end user firmly in mind, Myprotein boast the highest-quality sports supplements on the market which is developed in-house meeting the ISO9001 standard. Myprotein are also a member of ESSNA (European Specialist Sports Nutrition Alliance) who are a trade association overseeing the implementation of European Legislation on all Sports Nutrition products across the EU. It is these measures that can allow you to rest assured that you are receiving only the finest supplements and foods available. Myprotein’s approach in the health and fitness industry has revolutionised the way sports supplements are taken with huge votes of confidence from its customers racking up an applaudable 19,000+ reviews on Trustpilot. and more recently, Michael Bisping from the UFC! Although no brand is perfect, customer satisfaction sits firmly at the top of Myprotein’s list. It is little wonder that they have continued to dominate within the health and fitness space for more than 10 years and have growing international presence in the US. Regardless of where you are on your health or fitness journey, Myprotein offer something for everyone. The ease of navigation on their website means you are able to shop according to your personal goals and/or sporting requirements across various disciplines such as football, rugby, martial arts and bodybuilding. What is inherent, however, is that Myprotein do not restrict their offering to powders and fluids like most traditional sports nutrition companies. Their extensive range comes in every shape and form including gels and tablets which means tailoring your nutrition program has never been easier giving you that extra freedom to mix and match at every opportunity. With all of this in mind, do not forget to use a discount code and voucher while shopping with Myprotein (especially one from CheckMeowt) as you will really be missing out! Alongside taking advantage of our discount codes and vouchers, you could be saving a lot more by joining Myprotein’s loyalty reward scheme. Every time you shop at Myprotein, you are eligible to earn 1 MP Reward Point which is 1 penny of virtual credit for every £1 spent. For instance, if you spend £100 on your shop you will earn 100 MP Reward Points which equals £1 credit. Essentially, their loyalty reward scheme gives you 1% of your purchase back which you are able to use on your next trip if you so choose. 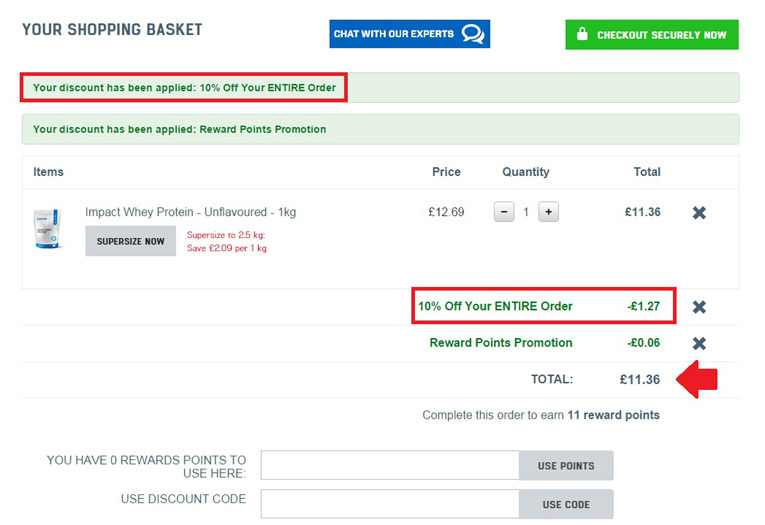 Although 1% may not sound like a lot, it is certainly worth considering if you shop at Myprotein frequently as you will be able to collect a hefty amount of points to use over time (which means more bang for your buck!). You will then see an overall breakdown of the points you have collected upon shopping at Myprotein, as well as the points you have spent on previous orders. If you have managed to accumulate a decent amount of points, you will be able to use this off your next order. To use your MP Reward Points, simply make sure you are logged into your account before you order - with some MP Reward Points to spend, of course. When you have entered the amount of points you wish to use, click the ‘Use Points’ button to receive your money off. This will be displayed by a successful green prompt at the top called ‘Reward Points Promotion’ followed by the saving you will have made which will be highlighted in green above your total (both shown in the red boxes). And there you have it! You will now enjoy even greater savings while shopping at Myprotein. Whether you’re saving up for a competition, a gift or simply looking for a good deal, you can’t go wrong with this amazing loyalty reward scheme. 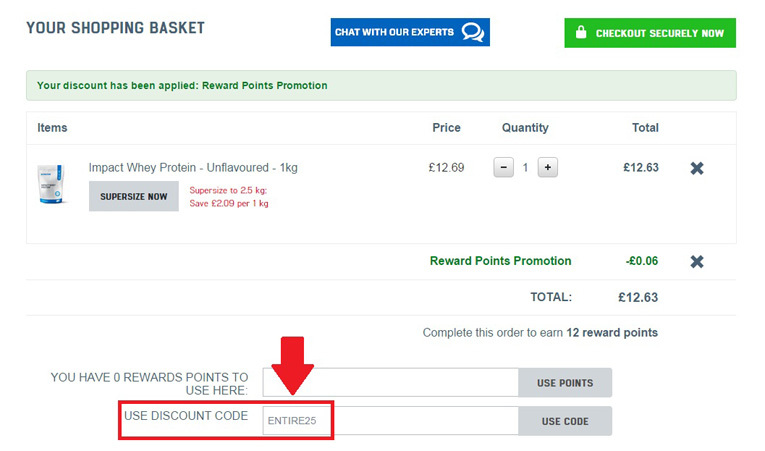 Hint: Alongside using MP Reward Points, Myprotein also allows you to use an existing discount code and voucher you may have found at the same time. This will give you a seriously price-cut offer which will allow you to really enjoy more of your hard-earned cash! We decided to use the Myprotein discount code ‘ENTIRE25’ to give us an extra 10% off our order. Upon hitting the ‘Use Code’ button we were met with an impressive £1.27 further discount on our order (in addition to the 6p off from our MP Reward Points) – giving us a total of £11.36 from an original price of £12.69! Give it a go today and see what bargains you can bag with Myprotein by using one of our Myprotein discount code offers on our website. 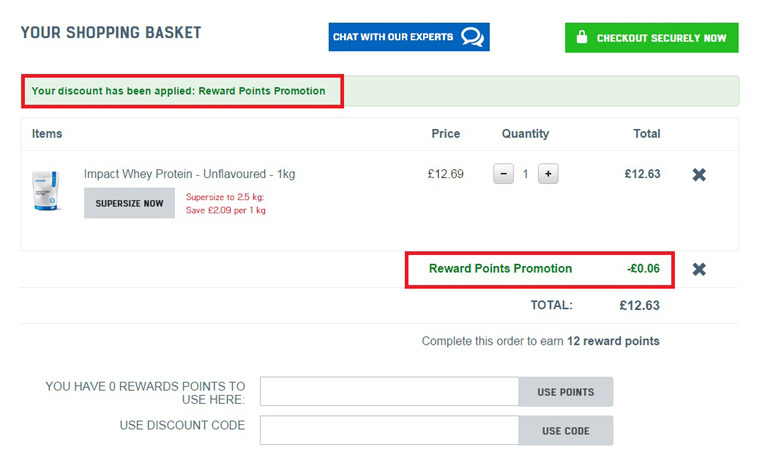 Myprotein also have a referral points system that allows you to earn 5 MP Reward Points for every £1 your friend spends through your unique Myprotein referral code. This is given to you for FREE when you sign up and register with Myprotein as a new customer only. If you recommend a friend who spends £20 on their first order, you will receive a whooping 100 MP Reward Points! If you have a lot of family and friends, you will be able to collect more points if you introduce them to Myprotein which will mean more great savings for you. 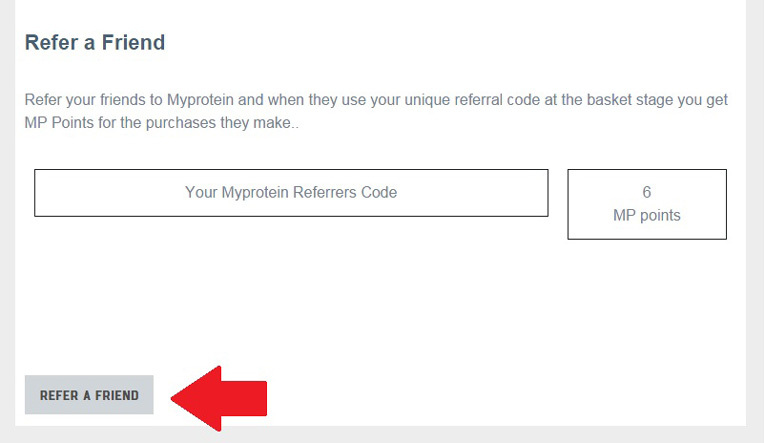 To check your unique Myprotein referral code, simply log into your account and scroll down to the ‘MP Rewards’ section – below you will find the ‘Refer A Friend’ area. Here you will also see how many points you have generated through referrals. The recipient will then be able to copy and paste your Myprotein referral code (which is unfortunately not attached in the above example as it is an old membership account) during the checkout process. 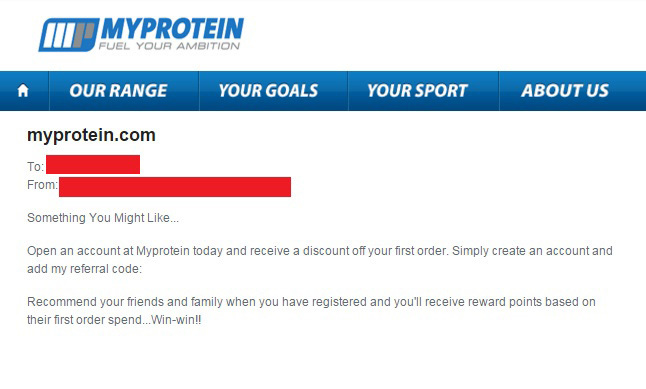 Alternatively, the recipient will be able to click on the email and be re-directed to the Myprotein website where there will be a cookie dropped onto their browser allowing them to track where the referral came from and attributing the MP Reward Points accordingly. Last but not least, keep in mind the ‘free delivery’ service that is often taken for granted by many online shoppers. Currently, Myprotein offer free standard delivery on all orders over £50. Although you will typically have to pay a premium for special delivery services (such as next day arrival), with careful planning and timing of your purchase you will be able to reap the full financial reward of this service. This is true if you are not in a rush to receive your order, or if you are looking to buy in bulk in excess of £50. The great thing about this benefit is that it will work in conjunction with any other discount code, voucher, loyalty and referral points you may have. From time to time, Myprotein will offer free delivery as part of a promotion or discount so do keep your eyes peeled for this across our website as they do save you a fair sum. If you would like further details on anything mentioned, or would like to shop at Myprotein, click here to be redirected to the official Myprotein website. Be sure you also subscribe to their mailing list where you will be able to get the latest and best discount and vouchers, product updates, reviews and more straight to your inbox. To get in touch with Myprotein, their best method of communication is either through one of their main social media channels including Facebook, Twitter, Instagram, Youtube and Google+ where you will be able to engage with either Myprotein specifically, or the wider community. Alternatively, if you wish to contact Myprotein’s customer services directly – make sure you are logged into your account in order to fill out an enquiry form.